Buying a home is a serious endeavor because you are tying yourself to a sizeable debt—a mortgage loan. A mortgage is a long-term financial commitment and a legally binding contract. 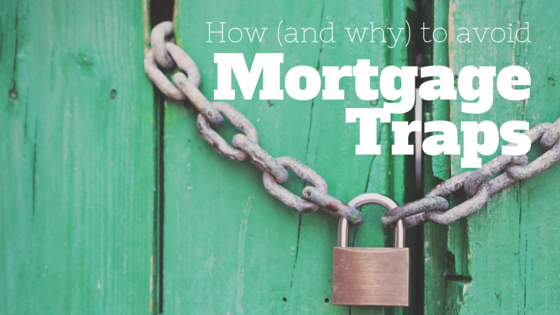 In order to make the best mortgage choice you need to educate yourself to avoid “Mortgage Traps”. There are two main types of mortgages – fixed-rate and adjustable rate – which one is the trap? For many people, an Adjustable Rate Mortgage (“ARM”) can be a terrible trap. 3/1 ARM Example: The three represents the number of years the payments are fixed and the one indicates the interest rate will adjust yearly. In this example the loan term is 30 years and the loan amount is 200K. The initial interest rate of 4.0% is low. However, after five years, the payment has increased by $411.98. Unfortunately, many people fall into an ARM loan trap believing they can evade making higher payments with a refinance. However, there are many factors that go into refinancing a loan. There is no guarantee that your home will maintain the value required for a refinance or that your personal finances will be sufficient to get a refinance approved. Any number of life choices such as marriage or starting a family could change your financial situation, making it difficult to refinance. Here’s another ARM trap—you plan to live in your new home for a short time and will sell the home before the mortgage rate increases. However, what if you’re unable to sell your home. There are many factors, which would prevent a homeowner from selling a home. The market may dip, making it unwise to sell the home for less than the original purchase price. Moving is expensive, you may not be in the financial position to move. You may have fallen in love with your home and decide not to move. You cannot predict your life, so you should be able to at least predict your mortgage rate. Selecting a fixed rate mortgage ensures you will always know what your payment amount will be in the future. If you are a first time homebuyer and just learning how to manage your finances I advise you to avoid an ARM loan and stick with a fixed rate 30 year mortgage loan.